So far, the best batch together with the No.4 - smoke helps to uncommonly cover missing maturity. The Sauternes barrel also brings in a good spice and some oak. The smoke aroma and the pepperiness almost make you think you have a very young Talisker in your glass. Malt, warm aromatic smoke (it has a touch islay feeling), vanilla and some caramel, fruity New-Make character with pear, a pinch of chilli (spicy spices). Clearly still very young, but the smoke helps a lot to cover it up and the spice adds depth to the flavors. Pfeffriger start, quite creamy with lots of malt and vanilla, citrus and only subtle smoke, subtle mineral and a hint of pecan nut. A little bit off the nose and the finish. Goes oily down, caramel and vanilla, here is the smoke again stronger, very warm, neat pepper and a touch of oak and a little dry sweetness. Short and dry with warming smoke. I was surprised. Had typed on a rather young Islay Malt. First smoke. But then also some sweetness and fruit followed by seasoning. The fruits remind me a little of fermented, slightly rotten white grapes. Green apple. Sugar beets. Also citrus fruits come. Go in the direction of lemon. Then comes the spice that reminds me of nutmeg. Everything carried by the smoke. In the mouth first a decent sweetness and also relatively creamy. Herbal honey and caramel. Also a bit flowery. But then he starts and it comes sharpness. Chili and pepper. Salivation begins and citrus fruits return. The smoke reminds me a bit of frankincense. The sharpness is still holding. Piquant. Smoke. It gets a bit drier. 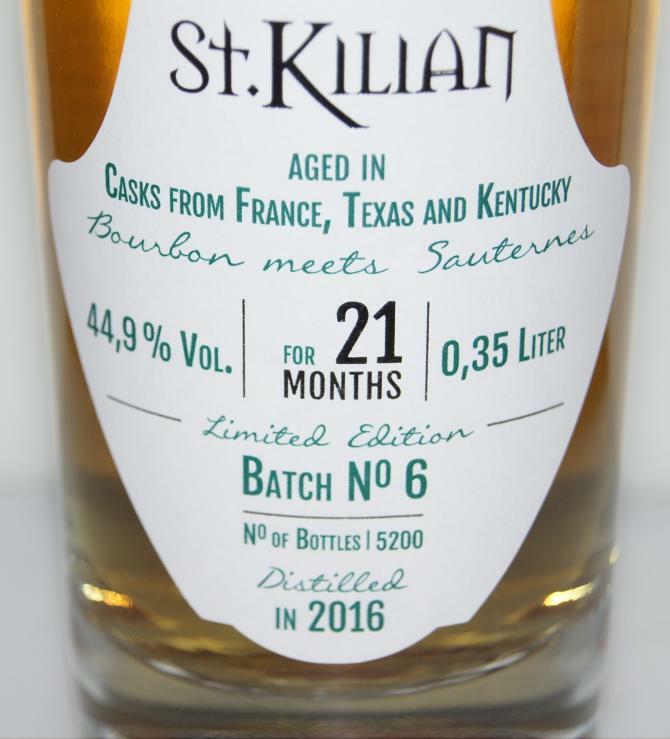 "Bourbon meets Sauternes" - Batch 6 of our "Spirit of St. Kilian" combines pithy peat notes with a tantalizing sweetness of vanilla and spicy aromas of roasted nuts. Especially for this batch, our Master Distiller Mario Rudolf has not only selected three different barrel types, but also three different New Makes - including our most smoky yet. Batch 6 matured in our barrels for at least 21 months. The foundation of this barrel-aged malting brand is our award-winning "Turf Dog" - a smoky new make with a fruity-fresh profile. The peated Spirit matured in three classic 195 gallon Bourbon Barrels from Kentucky and a particularly small 55-liter Quarter Cask from Texas Garrison Brothers craft distillery - giving it even more vanilla and honey notes. But for our latest creation, we put even more on it: Our "Turf Beast" - a brand of heavily-pitched Highland malt with a smoke content of 92 ppm - also matured in former bourbon barrels and brings a warm campfire flavor. 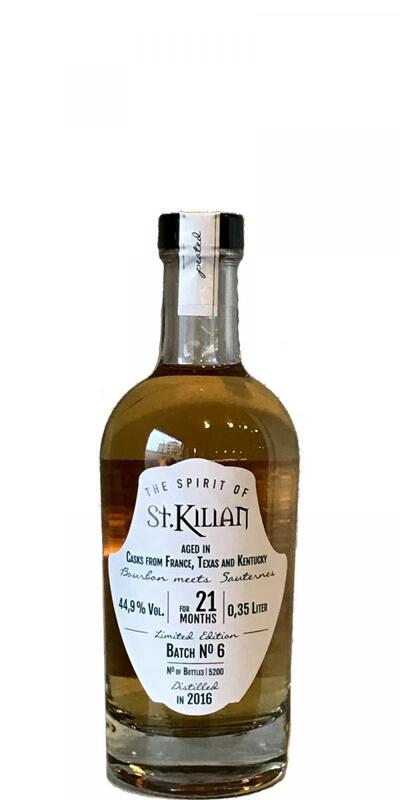 For a harmonious integration of peaty notes and a fruity counterpoint provides untapped Spirit, matured in three French 225-liter Sauternes white wine barrels. It complements the smoke character with a delicate fruitiness and spicy nutty accents of European oak. With Batch 6 "Bourbon meets Sauternes" we offer our fans a true character spirit that is just like us: passionate, independent and full of surprises. 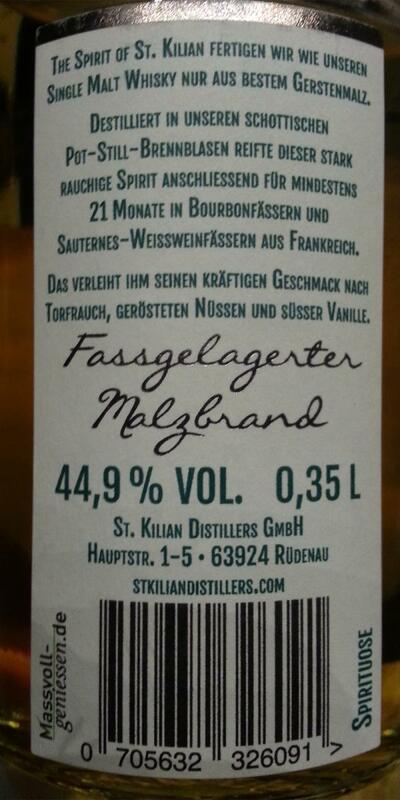 - Bottled as barrel-stored malt brandy with 44.9% vol.